At Ridgefield Academy, we teach children how to learn. On Thursday, January 17 from 8:30 to 11am, RA will host its January Open House and invites you to a morning of what it is like to be a Ridgefield Academy student. Visitors will have the opportunity to sit in on multiple classes, meet our talented faculty and administrators, hear from our Lower, Middle and Upper School students and learn about our Preschool through Grade 8 Program! 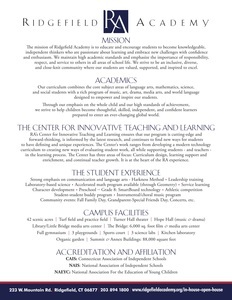 During your visit, you will also hear from Head of School Tom Main regarding his philosophy on the Preschool through Grade 8 education and learn the importance of RA’s commitment to educating the “whole child” through our engaging program. This event is open to the public.